Welcome to BEAD-DOLL-ZZLED. 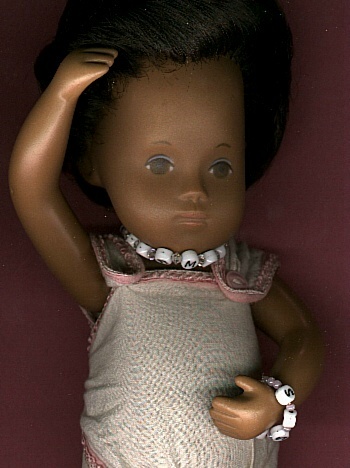 We make custom order jewellery for antique dolls to modern ones. Please view the pictures posted for a sample of our work and email with any enquiries. Chatty Baby, Tiny Chatty Baby, Chatty Cathy, Charmin Chatty, Tiny Chatty Brother, Thumbelina, Patti Playpal and friends and so on. We will match colours to original outfits or to your specifications...we only use high quality beads in glass, wood, semiprecious and crystal for all our jewellery. Please take a look at a few sample pictures to give you an idea. 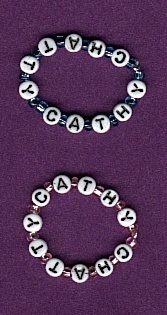 Below are some various bracelets for Chatty Cathy...the ones shown are $2.50 each plus shipping. The 3 bracelets above, show the baby id style for Tiny Chatty Baby and Tiny Chatty Brother...the accent beads can be added in any colour...each bracelet is lovingly handmade with high quality materials. Thumbelina looks so cute with her ID, here are 3 examples. Her bracelets are $3.00 each. This is a Sasha baby wearing her ID bracelet and a necklace as well. 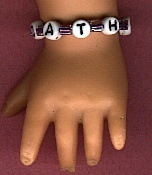 The pictures below show custom made bracelets for some special dolls in a collection. We can fit any doll and use combinations of beads that you want. These designs are one of a kind and made with the utmost care. Price is based on beads used and the size. They range from $2.00 and up. We can also repair jewellery for antique dolls and make jewellery for antique dolls such as earrings, necklaces, bracelets and beaded handbags. 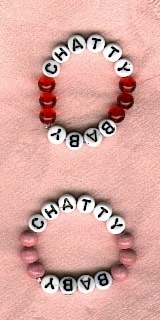 These bracelets are for Chatty Baby...the red ones are done with glass beads and match her original outfit perfectly. 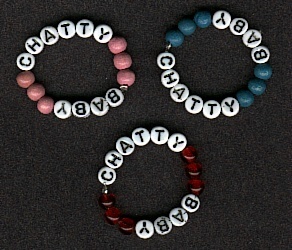 The pink and blue bracelets have wooden accent beads and are very sweet for Chatty Baby. We can do these up in any colours that you want. This is our double strand design for Tiny Chatty Brother. these 2 Baby ID bracelets are meant to be worn together in a double strand. This is a special style for that sweet little guy and matches his original outfit beautifully. Above are some more styles for Tiny Chatty Baby. 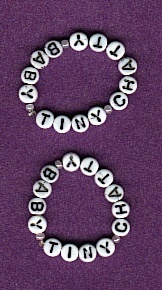 Here is a closeup of a sweet bracelet for a Sasha Baby...it is $1.50 plus postage. 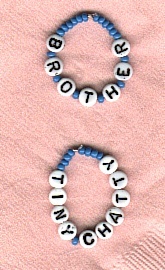 Here are some more custom bracelets. Please email with an order for your favourite doll. Watch for our new line of handbeaded custom made shoes for the Chatty Cathy doll and family of dolls. all prices listed are in US currency and I will be happy to convert to Canadian for you if needed.